For the character in Grand Theft Auto IV, see Javier Trunchez. For the character in Grand Theft Auto V, see Javier Madrazo. 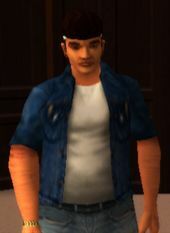 Javier is a character in the 3D Universe who appears as a minor character in Grand Theft Auto: Vice City Stories. He is voiced by Gregory Johnson. Javier is, in 1984, the boyfriend of Janet Vance. He is likely facilitating her addiction to drugs, although the pair tries to persuade Victor and Lance, two of Janet's sons, that they had changed their ways. They later steal their drugs and disappear without a trace. This page was last modified on 11 November 2013, at 17:55.